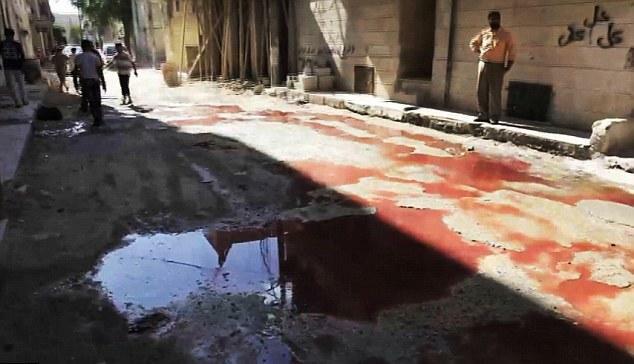 Streets of Syria literally awash in blood. Just days ago, the estimated number of al-Qaeda vs. al-Qaeda killed during their in-fighting has gone from less than 500 to well over 700, as reported by The Daily Star (of Beirut, Lebanon) on Jan. 16, 2014. Within 48 hours, a local human rights group has updated its estimate from “at least 482” killed since the fighting between rival groups intensified earlier this year, to more than 700 killed in that past 12 days of fighting between alliances. The Russian Times reported on Jan. 13, 2014 that the Syrian Observatory for Human Rights has been tracking the death toll so far in the al-Qaeda civil war in Syria. Early in the two-year-old Syrian Civil War against the central government of dictator Bashir al-Assad, there was a loose confederation of the many anti-Assad rebel groups. As months turned into years and as a slow but steady flow of foreign jihadists into the Middle Eastern nation, the BBC has estimated as many as over 1,000 various heavily-armed factions, or “militias” as many like to call themselves. Despite many of the groups swearing allegiance to the al-Qaeda terrorist organization, an Islamist civil war within the Syrian civil war has broken out. The heaviest bloodshed has been between the 5,000 strong Islamic State of Iraq and the Levant (ISIL) [also known as Islamic State of Iraq and Syria (ISIS)] battling the combined forces of Harakat Ahrar al-Sham al-Islamiyya (Islamic Movement of the Free Men of the Levant) with upwards of 20,000 armed members and their allies in the smaller but far more radical and bloody al-Nusra Front who boast of having 7,000 fighters. The groups are battling over an area known as “The Levant” which is a local term for the geographic swath of land stretching from Lebanon to western Iraq. As American, European, Saudi and Iranian weapons and money continue to flow to the hundreds of various jihadi groups, the body count is expected to rise, especially among those who the Islamists have a particular hatred for, such as the mostly unarmed Christian minority in the region.